Love your broccoli but it’s not doing well in the garden? Perhaps the broccoli plants are buttoning or forming small heads early in the growing process and never becoming a nice full size head such as you see at the supermarket. Or maybe heads are forming, but the results are broccoli with loose, bitter heads. There are several broccoli growing problems and primarily they are the consequence of one aspect — broccoli loves to play it cool. Why Do Broccoli Heads Become Loose? Broccoli that is grown in the fall produces the most tender, healthy, and sweetest broccoli that you will ever grow. In some areas of the country, spring conditions are still somewhat cool and predictable, but for many of us, spring temperatures warm too quickly, morphing into summer heat long before the calendar declares the summer solstice. When temperatures ramp up too quickly during the spring months, broccoli plants’ response is to open the flower buds prematurely, or bolt. This response to stress is also one of the causes of loose broccoli heads; indeed, it is the major cause. Temperature with days over 86 F. (30 C.) and night temps of 77 F. (25 C.) cause the plant to become vegetative-sans heads. In fact, almost all of broccoli growing problems are the direct result of stresses such as low soil nitrogen, low soil moisture, disease or insects, micro-nutrient deficiencies and most often, temperature fluctuations. 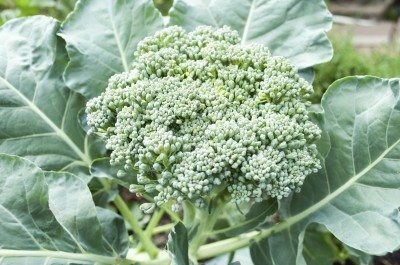 While broccoli plants may survive a freeze, they don’t take kindly to spikes in temperature, which will cause the formation of broccoli with loose, bitter heads as well as smaller and generally less flavorful florets. Finally, excessive nitrogen can also cause loose heads on broccoli. Therefore, proper additions of nutrients such as compost, manure or even nitrogen rich fertilizer are key ingredients. If you’re experiencing broccoli growing problems such as loose heads, you may wish to have the soil tested. 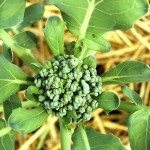 The simple steps to prevent loose heads on broccoli are to first, plant the seeds in the fall directly sown 85-100 days before the projected first frost of your region — usually mid to late summer. If you’re planting transplants, add 10 days to the “days to maturity” listed for the variety that you are growing and count backwards from the first expected frost date. Next order of business is to situate the broccoli plants correctly. Choose a site in full sun with slightly acidic soil (pH between 6.0-6.8) that is well draining and rich with organic matter. Broccoli needs lots of nutrition, so work in 2-4 inches of compost or manure. The correct pH and amount of organic matter is crucial to the development of the broccoli heads; boron deficiencies can cause another broccoli growing problem by producing hollow stems. Lastly to encourage compact heads in broccoli, space the plants 15-18 inches apart and set transplants deeper in the ground than they are in the pot. 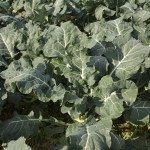 You may want to side dress the broccoli plants after you have harvested the main central head. This will encourage side shoot production. Just introduce a little nitrogen rich fertilizer, like manure or fish meal, into the soil at the base of the plant. 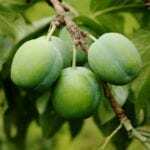 This works great for overwintering varieties, which should then be side dressed in late winter or early spring as growth begins anew.